Well that’s what we hope will happen in Denstone, and the surrounding villages of Stubwood and Quixhill later this year ! 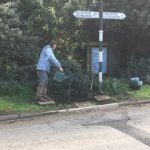 I was asked by a lovely lady in the village if I could plant some poppy seeds, so we found some visible spots around the signs along the Churnet Valley, not far from heywood Hall and opposite College Road. This is to commemorate 100 years after the end of the Great War in 1918. 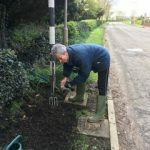 W e arranged a date and set to with spades and compost and the Flanders Poppy seeds to plant. It was cold and drizzly, perfect for ensuring the ground was moist in order for the seeds to germinate. 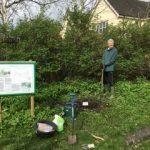 We dug and planted in 4 spots around Heywood hall and when all was finished we placed a small notice explaining what had been done and why. The Flanders poppy; Papaver Rhoeas had lay dormant on the front lines of France until 1915 when they were disturbed by the soldiers fighting in WW1 and coincidentally the weather conditions were just right for them to germinate. Every year for the following 4 years, poppies grew and their flowers lay like a red blanket across the fields on which soldiers fought. They also flowered in Turkey when the Anzacs landed in Gallipoli. The flowers of the poppy are now a poignant reminder of the fallen soldiers on Remembrance Day, 11th November and Anzac Day 25th April in Australia. So I hope with a bit of TLC and enough water and some sunshine ( please!) the poppies will grow into a lovely red show and just remind us of all those who fought for us in 1914 -1918. I hope they will reseed and come up again next year. Here is the lovely poem by John Mccrae.